Hearthstone: Heroes of Warcraft is an online collectible card game developed by Blizzard Entertainment. It is free-to-play with optional purchases to acquire additional cards and access adventures more easily. The game was announced at the Penny Arcade Expo in March 2013 and released on March 11, 2014. 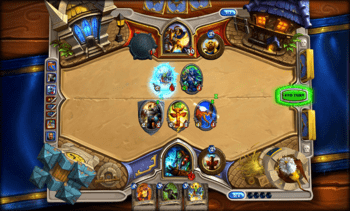 Hearthstone is available on both Windows and OS X systems, and is also available on iOS and Android devices. New content for the game involves the addition of new card sets and gameplay, taking the form of either expansion packs or single-player adventures that reward the player with collectible cards upon completion. Hearthstone is a digital collectible card game that revolves around turn-based matches between two opponents, operated through Blizzard's Battle.net. Players can choose from a number of game modes, with each offering a slightly different experience. Players start the game with a substantial collection of basic cards, but can gain rarer and more powerful cards through purchasing packs of cards or as reward for completing Arena runs. In-game gold is rewarded for completing randomized daily quests, which one is given each day, stacking up to three (one quest can be rerolled per day), and by winning matches in play mode or brawls, where 10 gold per 3 wins is earned with a 100 gold limit from wins per day. Hearthstone is set within the Warcraft universe, with its characters, spells and locations drawing from existing lore. An example of gameplay in Hearthstone: Heroes of Warcraft. Players play cards from their 'hand' such as minions, spells and weapons to interact with the game board and their opponent. Each Hearthstone match is a one-versus-one battle between two opponents. Gameplay in Hearthstone is turn-based, with players taking turns to play cards from their hand, casting spells, equipping weapons, or summoning 'minions' to do battle on their behalf. Unlike card games like Magic: The Gathering, the opposing player has no means to interactively interrupt or counter the current player's action during their turns, though may play cards on their turn that will create events that automatically respond to the other player's actions. Games may be between two players, or one human player and one computer-controlled opponent. Each player is represented by their chosen 'hero', an important character from Warcraft lore. Each hero represents a particular class, determining the special cards and unique hero power available to them. Each hero has 30 Health - if that number is reduced to zero, the hero is destroyed, and the controlling player has lost the game. The available classes, along with their hero name, are Mage (Jaina Proudmoore or Medivh), Priest (Anduin Wrynn), Warlock (Gul'dan), Paladin (Uther the Lightbringer), Warrior (Garrosh Hellscream or King Magni Bronzebeard), Druid (Malfurion Stormrage), Hunter (Rexxar or Alleria Windrunner), Rogue (Valeera Sanguinar) and Shaman (Thrall). Players can choose to play using one of several pre-assembled 'basic' decks or a deck of their own making. While many cards are available to heroes of any class (the neutral cards), a substantial portion is limited to a specific class, giving each hero their own strengths and unique possibilities. At the start of the game, each player draws cards from their respective deck of thirty cards. The first player draws three cards while the second player draws four. Next, the players enter the "mulligan phase." In this phase, both players can return any number of cards back to the deck and redraw the same number of cards. At the end of the mulligan, the second player gets another card called "The Coin," a card that gives a single use mana crystal for one turn. Despite the second player's two card advantage, lead designer Ben Brode claims that on average the first player has a 3% higher chance to win, and Ars Technica's analysis of three professional tournaments yielded an insignificant edge to the first player. During their turn, each player may choose to play any of their cards, use their hero power, command their minions to attack targets, or attack directly using their hero, if they have a weapon equipped. However, which actions the player is able to take is partly determined by their mana, a resource pool which is refreshed at the start of each turn. Each player starts the game with zero mana crystals, and gains one at the start of each turn up to a maximum of 10 mana. Each card and hero power requires the player to use a specific amount of mana in order to play it, strategically limiting each player's actions. The larger mana pools in later rounds allow players to play increasingly expensive cards, opening the game up to more powerful minions and abilities. A match is concluded when one or both players has/have reached zero health, or if a player chooses to concede. Completing a match will grant each player hero experience (winning earns additional experience) and grant them access to additional basic cards up to level 10 for that hero or golden versions of basic cards past level 10; once all heroes are level 60, the player will have every golden version of the basic cards. Each match takes place on a randomly selected battlefield, representing the board on which the game is played. There are ten possible battlefields: Stormwind, Orgrimmar, Pandaria, Stranglethorn Vale, Naxxramas, Goblins vs. Gnomes-themed area, Blackrock Mountain, the Argent Tournament Grounds, a League of Explorers dig-site-themed area, and a League of Explorers museum-themed area. Each battlefield features its own design and numerous interactive elements, but gameplay is in no way affected or determined by battlefield selection; the differences are purely cosmetic. Around the battlefield are the game's important UI elements, which are each player's hand, deck, hero's portrait, hero's power, mana crystals, the log of recent cards played/actions taken and each hero's summoned minions. In the card interface, players can create and edit their decks from existing cards, as well as 'disenchant' and create new cards. Cards are the main substance of Hearthstone, representing the abilities, characters and effects which each player is able to make use of during the match. There are 743 unique collectible cards in the game, with more planned to be added in the future through additional expansion packs and adventures. The first adventure, Curse of Naxxramas (Naxx), added 30 cards. The first expansion, Goblins vs. Gnomes (GvG), added 123 cards. The second adventure, Blackrock Mountain (BRM), added 31 cards. The second expansion, The Grand Tournament (TGT), added 132 cards, and the third adventure League of Explorers (LoE) adds 45 cards. In all normal game modes except Arena, the player does battle using a deck of 30 cards, constructed from cards in the player's collection. Each deck can only feature two of each card, and only one of each legendary card. Legendary cards are the rarest cards in Hearthstone and are based on special characters that played an important role within the Warcraft world. When summoned, Legendary cards will play a special animation or sound and will also have a dragon border around them. Arena play features no such limitations, but requires players to play using a new deck chosen from a series of randomly provided selections. For either type of deck, the construction of a player's deck is a key strategic element in the game, determining which cards are available to them during the course of a match. Each player starts the game with a wide selection of basic cards. Cards of higher rarity can be obtained by purchasing card packs, as rewards from arena mode, or as end of season rewards. Card packs and entry to the Arena can be purchased using real money or from gold earned in-game. Each card pack consists of five random cards, including at least one rare card. Obtaining new cards allows the player to add them to their decks, opening up new possibilities for play and strategy. Players can also use the crafting system to create new cards. The system uses arcane dust to craft specific cards. Arcane dust can be obtained by destroying existing cards, allowing players to convert unwanted or surplus cards into more desirable cards, from arena mode rewards or from end of season rewards. The crafting system was created as an alternative to the player card trading prevalent in trading card games such as Magic: The Gathering, with no plans for cards to be traded between players. Similar to the foils found in physical collectible card games, Hearthstone features golden cards that are special versions of regular cards featuring a golden border and unique animations. These cards are less common than the regular ones and are worth more arcane dust. Golden cards differ from their regular counterparts purely cosmetically and are designed to allow players to show off their golden cards to others. Five game modes are available to play in Hearthstone. Play mode matches players against other human players of similar skill. Players can choose to play casual 'friendly' games, or take part in ranked play, earning medals to reflect their skill and standing within the community. Ranked play features a 26-tier rank system, with wins allowing the player to progress to higher ranks, and losses causing them to descend in rank. The highest rank is called Legend. This rank cannot be lost until the season ends and the rank features the exact ranking in the player's region. All ranks are reduced substantially at the start of each season, with each season lasting for about one month. Participation in ranked play can earn players special cosmetic rewards, including additional card back designs and animated golden hero portraits. At the end of each season, Blizzard has awarded a card back for reaching at least rank 20 and bonus rewards, that include golden cards and arcane dust, the higher the player ends on the ladder. Solo Adventures are single-player modes against computer-controlled opponents that are either practice matches or Adventures. In practice mode, players can learn the basics of the game against 'basic' opponents that only use basic cards in their decks, or can play against 'expert' opponents that use a larger pool of cards. Players can also choose which class to play against. In Adventure mode, the player attempts to defeat bosses in order to unlock new cards. The boss encounters feature dialogue elements. The content of the first adventure, Curse of Naxxramas, is divided into five wings, with each wing based on a location within the adventure and the wings were initially unlocked for purchase weekly. Each wing is purchasable as a one-time transaction for 700 gold or real money and to access a specific wing, the previous wing must be purchased. The second adventure, Blackrock Mountain, also has five wings that are initially unlocked weekly. Bundle discounts are offered if purchasing all remaining locked wings at one time using real money. Arena mode costs gold or real money to play, and lets the player draft a deck of 30 cards by choosing between 3 random cards at a time. Players use their drafted deck to compete in a series of games against other arena players. Each arena run lasts until the player has reached three losses or twelve wins, or chooses to retire their deck, at which point they are granted a number of rewards determined by the total number of games won. While constructed decks have limits on the number of copies of the same card, arena decks have no such limits. Tavern Brawl mode features one-on-one play against a player from the Battle.net friends list or random player in a match where the players have to deal with a specific set of challenges involving specific guidelines or use of preset decks and the challenge changes each week. Playing matches in this mode counts towards quest completion and is restricted to players that have at least one level 20 hero character. Duels, also referred to as 'Friendly Play', allows a player to challenge players on their Battle.net friends list in unranked matches. Duels offer no rewards, but allow players to play games outside of the other game modes. 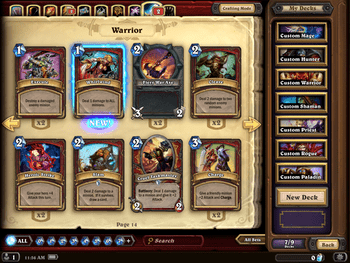 Additionally, the game features a tutorial that is a limited starting experience designed to introduce players to Hearthstone, in which the player is matched against a series of character opponents that includes substantial dialogue elements. The tutorial may be played only once by each account in each of the Battle.net regions. Hearthstone offers play in four different geographical regions: Americas, Europe, Asia and China. Players can only compete and communicate with other players within the same region. While each player is by default assigned to a region loosely corresponding to their registered country of residence, players are able to switch regions within the Battle.net launcher, allowing them to play against those of other regions if they wish, although players from other regions are currently unable to select the China region for play on the same device. However, each region holds a separate profile for each player, and it is not possible to transfer cards, gold, friends lists or other details between regions. Players wishing to try a new region therefore have to begin the game from the start, including replaying the tutorial. From the beginning, the game was designed to be played solely online and to mimic the feel of physical cards; the game starts with the player opening a box, during gameplay the cards waver and move while in their hand, and cards when played slam down on the board. When attacking, cards leap across the board to strike the target; when a massive spike of damage is dealt, the board shakes; when a massive creature is summoned, an unseen audience gasps in awe. Hearthstone also offers interactive boards. The boards on which the cards are played can be interacted with in various ways, although the feature is purely for entertainment and has no effect upon gameplay. Blizzard experimented with cross-platform play during development, having successfully played a game on PC against a player on an iPad; however, it was not a feature at launch. Cross-platform play was added in April 2014. 'Adventures', single-player game modes featuring "boss" fights, have also been released. Adventures offer rewards in the form of new cards, with each adventure introducing 20-45 new cards. Hearthstone also features expansion packs, which contains between 100-200 new cards, as well introducing new features. The soundtrack was composed by Peter McConnell; with trailer music by Jason Hayes. The development team behind Hearthstone is named Team 5, since it was the fifth development team formed at Blizzard as of 2008. It started off with only 15 members, as opposed the 60 to 100 usually assigned to a Blizzard game. As of November 2015, the team had 47 members. Hearthstone was first announced at Penny Arcade Expo in March 2013 for Windows, Mac, and iPad, with a release date of the same year. In August 2013, the game went into closed beta, to which over one million players had been invited as of November 8, 2013, with plans to enter open beta in December. Blizzard continued closed beta into mid-January 2014 despite their original estimation. Blizzard announced open beta for North America on January 21, 2014. Open beta was announced for Europe on January 22, 2014 and on January 23, 2014 open beta was made available in all regions. The game was released on March 11, 2014, available on Microsoft Windows and OS X operating systems. By the end of March 2014, the game had more than 10 million player accounts registered worldwide. On April 2, 2014, the game was released for iPad in Australia, Canada and New Zealand. On April 16, 2014 it was released globally, supporting all iPads except the first iPad. On August 6, 2014, support for Windows 8 Touch devices was added to the game, although not for Windows RT devices. The first adventure, Curse of Naxxramas, was released on July 22, 2014. It includes 15 bosses and nine class challenges that awards 30 cards, which includes nine class cards and six legendaries, and an exclusive card back if all heroic bosses are defeated. By September 2014, there were more than 20 million registered Hearthstone accounts. The first expansion pack, Goblins vs. Gnomes, was announced at BlizzCon in November 2014 and then released on December 8, 2014. The expansion includes 123 cards, which includes 72 class cards, which are included within the expansion specific card pack. Pricing for the packs are the same as the classic packs. On December 15, 2014, the game was released for Android tablets 6" or larger in Australia, Canada and New Zealand and on December 16, 2014 it was widely released for Android tablets. By January 2015, there were more than 25 million registered Hearthstone accounts. The second adventure, Blackrock Mountain, was announced at Pax East on March 6, 2015 and the first wing was released on April 2; the other four wings were opened weekly thereafter. It includes 17 bosses and nine class challenges that awards 31 cards, which includes 18 class and five legendary cards, and an exclusive card back if all heroic bosses are defeated. On April 14, 2015, the game was released for iPhone and Android smartphones worldwide. The smartphone version of the game includes new UI elements that places the player's hand on the bottom right but only half visible, so players must tap on their hand to zoom in and play cards. Single cards can also be viewed full screen by tapping and holding on a specific card, which is useful to read all the card details while using a normal phone display. On May 6, 2015, Activision Blizzard announced that Hearthstone and Destiny have generated nearly one billion US dollars in revenue for the company. According to Superdata, as of June 2015 Hearthstone takes in about $20 million in revenue per month and the active players consist of about eight million PC players and nine million mobile device players, with some overlap between each group. As of May 2015, there were more than 30 million registered Hearthstone accounts. The second expansion pack, The Grand Tournament, was announced on July 22, 2015, and was released on August 24; the set includes 132 cards from the expansion specific card pack, which costs the same as previous card packs. The third adventure, League of Explorers, was announced at BlizzCon 2015 on November 6, 2015 and the first wing was released on November 12; the other three wings were opened weekly with a one week break after the second week. It awards 45 cards, which includes five legendaries and an exclusive card back if all heroic bosses are defeated. To mark the release of Hearthstone: Heroes of Warcraft, Blizzard released the Hearthsteed mount for World of Warcraft players, that is obtained through winning three games in Arena or Play mode. Widely advertised on various World of Warcraft websites, this promotion encourages World of Warcraft players to try Hearthstone, and marked the first significant crossover implemented between Blizzard games. Players who purchased the Diablo III: Reaper of Souls expansion pack received classic card packs, with the deluxe and collector's editions granting additional packs. Players who purchased World of Warcraft: Warlords of Draenor Collector's or Digital Deluxe Edition received an Orc handiwork themed card back. Heroes of the Storm players who reach level 12 receive a Heroes of the Storm themed card back and after winning 100 Play mode matches receive a Heroes of the Storm mount that looks like a flying card. Players who purchase the StarCraft II: Legacy of the Void deluxe or collector's editions receive a Protoss card back. Hearthstone players who pre-ordered the Blackrock Mountain adventure's five wings received an exclusive card back and players who pre-ordered fifty card packs of the The Grand Tournament received an exclusive card back. Despite the designers' focus on accessibility and fast-paced gameplay, Hearthstone has been the focus of a number of tournaments. Blizzard hosted an exhibition tournament in November 2013 called "The Innkeeper's Invitational", featuring several well-known gamers such as Dan "Artosis" Stemkoski, Octavian "Kripparrian" Morosan, Jeffrey "TrumpSC" Shih and World of Warcraft multiple Arena season winner Byron "Reckful" Bernstein. In December 2013 2P Entertainment hosted a huge tournament with a prize pool of 30,000 RMB (about $US4,841) featuring the best players of the Chinese server versus the best players of the American server. In March 2014, The eSports Association (TeSPA) announced the Collegiate Hearthstone Open, a free-to-enter tournament open to all North American college students, featuring $5,000 in scholarships. Major League Gaming, ESL and the ZOTAC Cup all continue to regularly host minor Hearthstone leagues in the North American and European territories with small or no prize pools aimed at everyday players. Hearthstone was the focus of a number of tournaments during its closed beta, including those hosted by Major League Gaming and ESL. Blizzard "were a little surprised, in a good way" with the game's success as an eSport during its closed beta. In April 2014, Blizzard announced the first Hearthstone World Championship would be held at BlizzCon on November 7-8. The tournament featured players from each of the game's four regions, with each region holding its own regional qualifying tournament. The Americas and Europe regions' qualifiers featured 160 players each, and determined half of those players from actual in-game performance in Ranked play during the April-August seasons. The 4 most successful participants of each region's qualifiers went to the World Championship, for a total of 16 players. The Hearthstone World Championship 2014 featured a total prize pool of $250,000, and the winner, James "Firebat" Kostesich, received $100,000. The second Hearthstone World Championship was held at BlizzCon 2015 on November 7, 2015 and it was in the best-of-five conquest format; the winner Ostkaka received $100,000. Hearthstone: Heroes of Warcraft has received generally favorable reviews upon release, holding a score of 87.57% on GameRankings and 88 on Metacritic based on a dozen reviews by major video game critics. The game was praised for its simplicity, gameplay pace, and attention to detail along with being free-to-play, while the lack of actual card trading between players and any form of tournament mode were pointed out as the major shortcomings. Eurogamer gave the game the perfect score of 10 and remarked that the game is "overflowing with character and imagination, feeds off and fuels a vibrant community of players and performers, and it only stands to improve as Blizzard introduces new features, an iPad version and expansions." IGN and Game Informer both gave the game a slightly lower grade of 9/10, with IGN's Justin Davis praising the game for its "elegant simplicity of rules" and "impressive attention to detail and personality, and the true viability of playing completely for free make it easy to fall under its spell and get blissfully lost in the depths of its strategic possibilities." GameSpot gave the game a score of 8/10, praising the game for its depth and complexity. The only major drawback noted was that the "absence of extra features hampers long-term appeal". Later Hearthstone: Heroes of Warcraft card expansions have also been well received. Game Informer rated the Curse of Naxxramas expansion 9/10, stating "Naxxramas is an excellent addition to the core game, and an exploration of sorts to examine the potential for additional single-player Hearthstone content [...] the adventure provides a substantial amount of new content that spills over into ranked, casual, and arena mode and changes how you approach the game." PC Gamer found that "[Curse of Naxxramas is] a much-needed and fun refresher for Blizzard’s card battler", however "the next card expansion will need to be more sizeable", rating it 78/100. Reception for Goblins vs. Gnomes has also been positive, with Game Informer writing "the first expansion set for Hearthstone is a major step forward for the already accessible and fun game", and awarding it a score of 9.25/10, while Eurogamer scored it a 80/100, writing "whatever happens to Hearthstone in the future, the new content has stumbled a little by strengthening certain deck archetypes that needed no such help [...] it's re-introduced a thoughtfulness to play that's been absent for too long." At The Game Awards 2014, Hearthstone was awarded best mobile/handheld game. In December 2014, GameSpot awarded the game with mobile game of the year. GameTrailers awarded the game with multiplayer game of the year and best overall game of 2014. At the DICE Awards 2014, the game was awarded with mobile game of the year and strategy/simulation game of the year. The game won the 2014 BAFTA Video Games Award for best multiplayer game. It was nominated for the eSports Game of the Year Award at The Game Awards 2015.